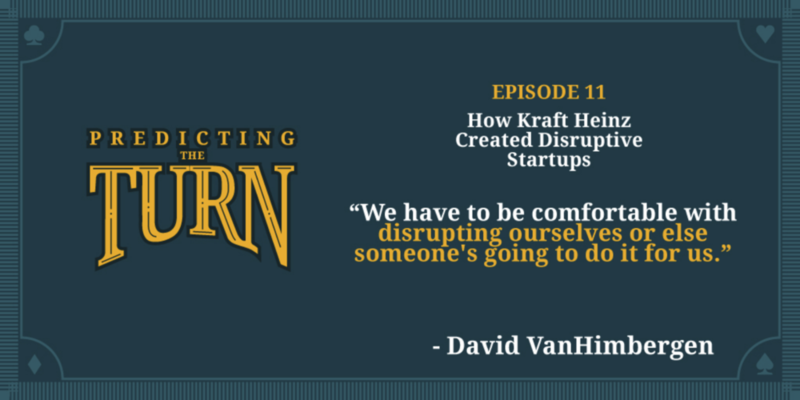 David VanHimbergen: We have to be comfortable with disrupting ourselves, or else someone's gonna do it for us. Dave Knox: I'm your host Dave Knox and this is Predicting The Turn, a show that helps business leaders meet their industry's inevitable disruption head on. Dave Knox: Welcome to another episode of Predicting The Turn. Today I'm joined with David Van Himbergen, Head of Springboard Brands at KraftHeinz. Welcome to the show, David. David VanHimbergen: Thank you. Glad to be here. Dave Knox: Awesome. So, David's an old friend of mine from our days together at Proctor & Gamble, and today we're going to cover some of the work he's done there, but then his new job that he moved into at KraftHeinz recently. Where I want to start, though, is in my book Predicting The Turn, I talk about this concept of disrupt the disruptors, and where the Fortune 500 can take inspiration from the startups that are out there. They're innovating and doing different things. Dave Knox: When I was writing that, one of the first things that came to mind was actually the work you were doing at Tide Spin and this idea of taking an inspiration in the service industry and trying something new. Tell us about the origin story. How'd you start working on Tide Spin back in the day? David VanHimbergen: Yeah, so I had been with Proctor & Gamble for I guess around 15 years at the time and moved all over the company in various roles. The role that I was in, I was leading global innovation for Tide in a group that was called FEI for like front end innovation. Within that group we were just looking and exploring kind of new or different models, so we actually came up to Chicago for a kind of a quest inspiration trip. This was, call it 2014, so there was a lot of chatter around the sharing economy, and that really I think just sparked to us about this idea of like call it Uber or Airbnb, where you can create a marketplace where a valuable brand could kind of do nothing more but just pair up supply and demand. David VanHimbergen: That kind of led to the inspiration of like, "Okay, what would that look like for Tide?" Eventually then we just started playing around with the model a little bit. As we got deeper into understanding the consumer tension points of like, "Look, people hate doing laundry, especially if you live in a city where you may not have access to a washer and dryer in your apartment, it's even more of a hassle." It just kind of snowballed from there and then we started to evaluate the marketplace. We saw some venture capital was going into it. Then, it was just like, "Okay, if we were going to participate in that what would it look like for Tide?" And everything just kind of took off from there, I'd say. Dave Knox: That's awesome. When you had that, building a technology company, that's usually not a core competency of the world of SPTs, so you don't have a bunch of coders sitting around waiting for you to do that. So, how did you even think about that launch phase? David VanHimbergen: Yeah. It's actually funny we're here at 1871 today because that was, I think this was our starting point. Initially, you know, we kind of went down that path of like, "Okay, how do we build out this model?" We were very much embracing the lean startup method of like, "Okay, we don't want to over-invest. We want to be very focused on validating those assumptions within the business model that are the most critical and not get distracted by other things." Fortunately, so actually, our President, who was a sponsor, the first time we came into pitch it, we said, "Okay, look, here's the rationale strategically why we think we need to play in this space, the consumer landscape. We want some money to kind of go off and build a prototype, to go off and test this model in Chicago." David VanHimbergen: I think, rightfully so, he kind of called us on that. He was like, "Why would we invest in building that out? There's so many fundamental aspects of the business model that we need to prove out first. Go out and try to find a more create solution." That was where, us being here at 1871, we were just at the early stages of establishing our membership. We actually found a company based here that had a white label solution, that they were selling off the shelf to mom-and-pop cleaners. And so, we were able to work with them and partner to create a duplicate instance of that. David VanHimbergen: It was a very good strong platform, especially for a MVP-type level service, that provided all the technology that we needed. It had kind of the management dashboard for the backend stuff, it had a couple different front end mobile apps for consumer experience and also driver experience. And so, finding that partnership here through 1871 and others, was really I think the opportunistic thing that once we went back and said, "Okay, we've got this solution here. It's actually not going to cost us very much to get into the market very quickly. Like we're talking, 30, 45 days," and start learning. So, I think that was kind of the pivotal moment for us and how we handled that decision of, "Okay, how do you determine if you're going to build versus partner and other options out there?" Dave Knox: Yeah, no, and that's such a key part because I think a lot of people wanna go hire all the engineers, hire all the hackers, start building themselves. And building a digital product's a little bit different. David VanHimbergen: Yeah, very challenging. And I think you, it's kind of the fundamental basis of the whole lean startup principle though, but if you go off and build something and you don't know what you're gonna build, you're inevitably gonna waste time and resources, building stuff that consumers don't want and need. So us, starting off with a solution that had, at least been validated in market from the team here that was kind of that founding startup we were working with, that in addition to we ran that with them for six to twelve months before we got to the point to say, "All right." We were starting to grow out of what that solution could provide. Then we decided we needed to go off and build our own tech platform, but at that point we had been in market for six plus months. David VanHimbergen: And so we knew exactly what those requirements were. Additional functionality, we wanted to build things that we didn't really need, so we could get really smart about that build process. Dave Knox: That's makes sense. So recently P&G announced that what you'd started with Tide Spin was gonna be expanding nationwide as Tide Cleaners as kind of a name. So, this Ad Age, when they talked about it, they said, "This is building upon the last 15 years of P&G trying to think about service." You kind of indicated that was one of your really early inspirations. When you've got big companies that are going outside of their traditional go to market. You know a company that sold product, now moving into service, and new business models. What lessons did you learn along the way, of how do you change that mindset? David VanHimbergen: Yeah, so I think as that Ad Age article cited, they talked a lot about a juvien pilot we did in kind of 2000 in Atlanta, where it was kind of a full service laundry. And there were a lot of great learnings from that pilot program. I can't remember how long it lasted, maybe a year or so. But it was great because we had a team there that we could go back to as we were starting Tide Spin and say like, "What worked, what didn't." Plus, we had that concept, Tide Dry Cleaners which is a franchising network and our friend Andy Gibson's been part of that. And so like they had a lot of institutional knowledge as well. So we'd already had some seeds planted in service, realized it was important. I think what was different about Tide Spin was just the way that we were gonna go to market, and it was kind of embracing this lean mentality. David VanHimbergen: And everything that we did when we came up to 1871, we kind of isolated ourselves. We got into the market that we were gonna operate within. We hired outside people with kind of that entrepreneurial mindset and the skills that fit where we needed, and basically built that team to say, "We're gonna go off. We have six months to go prove this. It's enough money just to get us to that point. By the way, it's not a lot of money, so it's not like we're gonna do a lot of frivolous marketing and other things. We need to be very focused on validating the operational model. But we've got six months to prove this out. If we do, great. If we don't, then we might all be looking for jobs soon." David VanHimbergen: So, it was kind of embracing really that entrepreneurial mindset of getting teams that were very dedicated and focused against it. But you're also feeling the reality of those constraints of like, "I've got a cash burn that's limited and only getting me to this point. It I don't prove out what I promised my investors, or in this case, the management team, then I don't have a future beyond that point." Dave Knox: Yeah, no, that makes total sense. So, let's switch gears to the world you're in now. So, six months ago, you left P&G, moved over to KraftHeinz, one of the biggest players in grocery. But food's also that first one that starts seeing these smaller niche players really take market share and grow. So, this new role as the head of Springboard Brands, what falls under? What's your mandate and what are you working on? David VanHimbergen: Yeah, so Springboard is a platform that the company built, just about a year ago. And you know I think it was at the time, the company kind of realized like. "Look, we see the disruption happening across all the industries." Food, especially me stepping into food for the first time, I've been more on the soap or the toothpaste business in my career at P&G, but just shocked at the number of entrants coming in. And it's pretty apparent, like the influence of ... how much influence of the people of just new diet trends they set for things that we're shaping, clean ingredients. David VanHimbergen: And so, products within the KraftHeinz portfolio, I think they realized, "Okay, we've got number one, number two brands, but there's a lot of disruption coming." There's this emerging trend across natural organic, clean products, that obviously that's where a lot of the focus from startups is centered around, and we're not really, we're not at KraftHeinz, positioned to win there. So we need to figure out, how do we start building capability and partnering with folks on the outside that are building these authentic propositions. They've got an inspiring founder story, but they're out there creating these propositions that are, we believe, are gonna disrupt the future of food and beverage. And so Springboard is really designed to be the platform to allow KraftHeinz to participate in that. David VanHimbergen: So within it, we've kind of got ... there's three pillars to it. We've got an incubator program, so we invite startups to apply to be part of the program. We're focused on very early stage food and beverage companies. Typically, less than five million dollars in sales. But ideally, they've got a saleable product so there's something that we can work with. But we invite them in. It's a very competitive application. We get 2 1/2% acceptance, so we get around 200 applications, we choose five companies from that. We had the first class graduate last fall. David VanHimbergen: And really, this is a 16 week program where we bring them in, we mentor them. We introduce them to a lot of capability. We help coach them. Give them access to our facility, so they can start to think about their future product pipeline, and bring them in for that 16 week program, and hope that mentorship, their collaboration, and just working with other startup participants in their class, that they're gonna learn and advance themselves. That they accelerate, and they can increase their projections for the following year. So, that's kind of one big pillar of the program which is great. So, our second cohort actually starts in two weeks here, and we've doubled the size of that program to now where we'll be doing two classes per year. David VanHimbergen: The second big pillar is our accelerator program. So we have a few brands within the KraftHeinz legacy portfolio that we believed had a lot of voltage. So, Devour, BOKA, Jell-O Play, which is kind of an extension off of the Jell-O brand, and then Momofuku's a joint partnership we have with David Chang who leads Momofuku restaurant group. So, that one is really around like okay, taking existing brand where we feel like they have a lot of potential but they were brands within our wheelhouse that we could drop into the portfolio from day one and start learning against. David VanHimbergen: And then the third pillar in that is kind of around partnerships, which is acquisitions, mergers and acquisitions, and so kind of the biggest news on that front was the beginning of January, we announced that we were acquiring Primal Kitchen, which was a very strong player with a great founding story. That their core business was in kind of sauces and salad dressings, which is the stronghold categories for KraftHeinz, but they've got a very clean ingredient profile and standards, and they've had a lot of success in the natural channel. So, it just made a lot of sense as being a great fit within our portfolio. Of not only it's complimentary within channels where maybe we don't have the strength, but then there's just a lot to be learned from that, just in terms of their go to market approach, so. Dave Knox: Talent is a big part of Predicting the Turn. And as we talk about talent, I want to mention one of our sponsors. Hunt Club. Imagine the power of the best marketers in the world helping you to find your next marketing leader. That's the power of Hunt Club. Hunt Club is a new category of talent company, that powers the network of experts, connectors, and business leaders to help you find the best talent. Let's face it, recruiting hasn't changed with the times. Hunt Club is changing the recruiting game by leveraging technology and crowd sourced referrals to find you the best people possible for your company. Stop paying job boards that don't work, or recruiting firms that recycle the same active candidates. Partner with Hunt Club. Dave Knox: So, let's talk a little bit more about Primal Kitchen, because I think that's a really interesting acquisition, because it's in a space, a category you've already been playing in. So, how do you maintain that spirit of entrepreneurship when you do an acquisition? Also, when some of that market share that startup was gaining, was coming at the expense of your parent company? David VanHimbergen: Yeah, you know that's tough. I think first and foremost it comes from a mentality standpoint of I think, which more and more big CPG companies are embracing is that, look, we have to be comfortable with disrupting ourselves or else someone's gonna do it for us. So, I think there was just an openness broadly to that, that KraftHeinz management had of that, and that's really the justification for why they launched Springboard in the first place. But in terms of really protecting that entrepreneurial spirit, and making sure you don't lose the unique aspects of that culture that allowed that company to be successful, we actually researched quite a bit and did some benchmarking against other big companies. And those that have succeeded and failed as they acquire these bolt on companies. David VanHimbergen: And what we ultimately decided on is look, we want to maintain the independence and autonomy of this company as long as we can. So, when we were working with Primal Kitchen on that deal, we talked a lot about, "Look, we wanna make sure that you guys are retained, you're staying on. You realize that we want you to be part of this vision," and so that team, which is largely based out in Los Angeles, California, they're retained. They're still operating the day-to-day business. And a lot of the integration that we work on of like, "Okay, well KraftHeinz has a lot of capability, either from an R&D standpoint, or maybe even relationships through sales channels and whatnot." That kind of integration happens at their discretion, so we're here t kind of provide them with like, "Hey, here's some of the experience and things that capabilities that we have, that now you have access to." David VanHimbergen: But we want them to really be the ones that are pulling it from us, and that we're not pushing it on them. And I think that's critical so that they still feel that ownership sense, that this is their product and their brand. So, I think we're still very much early into this, right? It's kind of a couple months since the deal, but so far I think you talked to the team, which I do regularly, and I just think others in the company would feel highly confident that we're gonna be successful in this approach. Dave Knox: Love it. So, you talked about the incubator program as one of the things you're spending a lot of time on. And what's interesting is that is at the stage between experimentation and proof of concept. Which is really, really early stage for a big company to be getting involved and quite a few high failure rate that you're seeing in companies that phase. So what led you to be that kind of the focus that you want to dive into when you thought about the incubator? David VanHimbergen: Yeah, and I think for us, we felt that was probably the time in the lifecycle where we could have the most impact at KraftHeinz, because you get, I think its pretty obvious the barriers of entry are very low now. To start a product, you can find production, you can find capital. You can find distribution channels and you can advertise your brands through the social media channels. So, it's very easy for people to start up. So there's a lot of people that are passionate, that maybe have experienced some issue in their lifetime, like around a health or some limitation on their diet that drive them into like, "Hey, I wanna change the world. I know I can do that through food, because this is something that's personally affected me." David VanHimbergen: So they've got this passionate desire to do it, but they may not have the experience or the resources or the know how. So, focusing at that early stage, we feel like we can help support entrepreneurs who are very passionate about an idea, about effecting and using a bit of a cliché room, but disrupting the future of food and beverage that, as we're gonna help enable them to get something started because we can offer up some small capital. But then just give them access to like, "Okay, what does it mean to build a brand? What do you do to think about when you're designing that package? Not only from a visual aspect, but even from like a structural. What's that experience of as I open the product up? As I think about my preparation instructions, how are you making that easy, depending on your consumer target?" Et cetera. David VanHimbergen: These are all things that people at KraftHeinz obsess about. Because we do it every day but someone that's maybe a new startup, they may not know that. And so, that's really I think where we felt we had the biggest opportunity to make an impact, and then there's just, I think there's also to be said, something about just the energy that it creates there. These companies that are so early, I think there's just so much hope and just energy from that, and as we've worked with them, like our folks on our Springboard team internally that are maybe working on the accelerator side, they just feed off of that a lot. And so there's a lot to learn and then there's I think, just the spirit that just transcends across the organization when you bring them in, so. Dave Knox: Yeah, and that energy can't be underestimated, so with that, do they come and live in Chicago for the course of the program? How are you getting the rest of KraftHeinz to feel that energy and that exposure? David VanHimbergen: Yeah, yeah. So we bring them in, so it's a 16 week program. We bring them in to Chicago. We don't require that we're here, that they're here the full 16 weeks, because they're still growing and developing their business. There's sales calls, usually their production that's a co-packer is usually in another location, so we realize they have to visit them. But we really recommend that they have one person that's kind of on site throughout the 16 week period. And then there are about five weeks across the 16 weeks that we say like, "Those are pretty critical. You should probably be here," at least the founding team, two to three members to represent. David VanHimbergen: But we lease space for them out of a ... we work over on Michigan Avenue, just off of Grant Park. So they're kind of the same thing as when we were here in Tide Spin immersed in 1871. When you're in that culture you feel the energy. There's just natural collaboration that happens among the teams, just because the way the space is designed or even other startups within that group. And so I think that allows the teams to be very productive and kind of maintain that spirit and transfer of energy. And then we're bringing folks in from KraftHeinz. Our headquarters just down the street in the Aon Center. We'll bring them over frequently, either as part of the curriculum in teaching the classes, or like we like to do showcases with the founding teams, where in the 76th floor common area, we'll have just a showcase where they can kind of demo their products, they can talk about it. David VanHimbergen: And then throughout maybe a couple hour period, people throughout the company can kind of cycle through when they have free time, and just learn and meet the company. So, it feels kind of a good balance in terms of allowing that energy flow and transition to kind of go both ways. Dave Knox: Yep. Yeah, I love that. So you mentioned that you do a lot of benchmarking. What worked for some people, what didn't work for others. As you think about what's next for Springboard as you enter month seven, month eight here, what companies are inspiring you, for think about the next step for where you wanna take Springboard? David VanHimbergen: Yeah, I mean, I think there are a lot of companies out there that certainly seem to be playing in this new venture or looking at, "How do I supplement my R&D pipeline, with some external arm?" Whether that be a venture investment or some kind of incubator program, and whatnot. And there's certainly a lot across food that have been doing it, certainly longer than Springboard as well. Like General Mills has 301, Chobani has its own program. Unilever is kind of very famously, they've done a lot, even kind of going back to their Ben & Jerry's days as they've kind of protected some of their acquisitions. David VanHimbergen: So, I think it's about constantly learning. Next week is Expo West, which is kind of the biggest trade show for all food and beverage start ups. I'm really excited about that, because it'll be my first show. It's, I've heard it's a zoo, so I'm kind of preparing for that, but I've got a very busy agenda where I'm just out trying to network and meet people, so setting up meetings with folks on the investor side, to understand kind of what are they saying, what are deals that they're working on? Companies in their portfolio might be maturing to the point where they're looking for a strategic partner to exit with. There's meeting entrepreneurs and other startup companies to say, "Hey, can you find those folks that not only have that passion, but they've got this inspiring story," and there's a very attractive upside that we see where it could be a good portfolio fit for KraftHeinz. David VanHimbergen: And then I think third is just advisors out in the industry. So, it's just a ... I mean I kind of found that back in my days when I was in the Chicago startup community here in 1871 and others, of just like how closely connected everyone is within the community, and how willing they are to help and support. So, I just feel like the more interactions and connections you can make, that you just inevitably are gonna benefit from that down the road. Because there'll be a challenge that you'll encounter and you'll be like, "Gosh, here's something I've gotta try to solve, I'm trying to work through." And then you remember like, "Okay, here's someone that I had met back a while ago. They had similar problem, or they've got an expertise that might be able to help. Let me give them a call and see if they can help out." David VanHimbergen: So, it's kind of like a little bit of staying connected into the industry, and just constantly assessing like what are other people doing out there. You know, I kind of took that question a little bit of a path of not just the big companies but even, just I think it's a little bit about the method and just the networking, and just staying very connected to everyone, so that you're staying on top of the trends. Dave Knox: Yeah, no, but that's a really key thing, because as we think about innovation and all the other buzz words out there, a lot of people just focus on the companies and how the companies need to change. But companies are made up of people, and a lot of those people have been trained in a certain way of doing things, and that's what they know. That's how they do brand building or marketing, or even their industry as a whole. Dave Knox: Over your career, you've had a lot of shifts that you've done. You came into P&G doing systems analyst, moved into brand marketing. Then became kind of this corporate innovator that was challenging the status quo. How have you thought about that continuous learning, just for yourself and shifting gears in your own career, as you're in the middle of your career? David VanHimbergen: Yeah, it's funny. I'll look back sometimes and think about where I started, and how far I've come, and like I think you lose sight of that at times. And that's I think typical for an entrepreneurial journey too, is I would talk to other founders, is you get so deep into the day-to-day. So you really have to force yourself to step back and see the progress. And I would do that frequently in just our journey with Tide Spin. But even if I do that on my reflecting on my career, I came in as a systems analyst supporting a financial reporting system. But always what attracted me to P&G at the time, and even what I seen in KraftHeinz is just the openness to new opportunities and to grow continuously. David VanHimbergen: So, I just took advantage of that, and I think just constantly connecting with people. In my mind, I say, "All right, if I'm gonna work for a big consumer products company, marketing, and brand management is the path towards leadership." And so that's the skills that I wanted to build, and so eventually I just kind of tried to step to get at least some degrees closer to, "Okay, is this the right fit? Am I properly prepared so that I can be successful there?" And then I've just kind of taken advantage of that all along the way. David VanHimbergen: Honestly, as I think about my time when I was responsible for global innovation on Tide, that was my prior assignment, I was up on our target business in Minneapolis. And there I'm kind of all the way at the downstream end of kind of the business, where we're working with the sales team, helping influence buyers, selling marketing programs. We're at retail, negotiating. And when I was first, you know obviously I wanted to stay in laundry, and they were like, "Okay, we're gonna put you in front end innovation, which is on the other end of it." I was like, "Ooh, this might not be good. This is totally different from all of my experience." But I think just being open to the new opportunities and then within there, I think you just try to continue to dig and find that little, I think that nugget that you feel like you can really invest behind. And it can become eventually your gem. David VanHimbergen: And I just kind of was able to identify that early on, and it was like, "Okay, look, we're talking about new business models. I'm extremely excited about the evolution of technology and what impact that has in the creating new business models and whatnot." So, I just kind of jumped onto that, and then just rode it, and was fortunate enough to have leadership that was willing to support that. They allowed us to come up to 1871 here. They allowed us to run this thing for two and a half, three years. It's still going today. But I think it's just being open to new opportunities and trying to find the best that you can make out of it. And I think it comes down to personality a little bit as well, as I think I'm naturally curious, ambitious, and I just wanna make sure that I'm using my time to the best. David VanHimbergen: I never wanna get caught in the moment, where I feel like I'm just watching the clock move by throughout the day, waiting for it to strike 5:30 or whatever and it's time to go home. I want my days to kind of just race through, where it feels a little chaotic at times, but that's what energizes me, and so that's typically what I've looked for. I think it's, the fun thing about where I've ultimately ended up here with KraftHeinz is I feel like it allowed me to kind of leverage the prior experience, to kind of build and even stretch into more areas. So now with Springboard, not only are we looking at where we can kind of build new disruptive brands, but we've got this incubator program, so we can work with companies to build relationships early into that venture and life cycle. And then ultimately with someone like a Primal Kitchen, someone that's already done it and they've kind of been through that four year journey and now they've grinded it out, but they're looking at, "How do I take that next step and excel to the next level." Dave Knox: Yeah, so you talked about curiosity there, and that curiosity is at the heart of every entrepreneur, and it's also needs to be at the heart of every big company that's thinking about that next generation. Not every employee is wired that way. So, how do you think companies can really encourage that curiosity and that entrepreneurial thinking, so they can get to the next level and be around for the next 100 years? David VanHimbergen: Yeah, I think it probably comes down to a few things. I think first, you probably need to establish it as a cultural value for the company. So just you put it on the wall to say, "We care about this." And then that kind of trickles down to say as you're off recruiting employees, or you're assessing fit for roles and opportunities, you're saying like, "Does this person seem naturally curious? Are they constantly learning new things? Are they asking questions and kind of poking around where they don't understand?" Just to kind of get that baseline. David VanHimbergen: So, I think, one it starts with just the cultural standpoint and establishing it as a value. I think two, you need to create some space to allow for it. It's very easy to get caught up in the day-to-day, and just running around with whatever the latest fire drill is. There's always gonna be an instance where you're behind on a project, or there's an issue at retail that needs to be addressed and so you're kind of solving those fires, fighting those fires all the time. David VanHimbergen: So, I think the more that you can try to carve out space for people, so that they're putting that time into thoughtful, and you're encouraging them like, "Hey, learn new skills. Go off and subscribe to the Shopify blog. Read that regularly. Go out and take a class. Go out to General Assembly in Chicago and take a class on, how do I build out a social media marketing campaign? Start your own little company," so kind of encouraging that. I can go on and on with all these examples. But I think encouraging that. David VanHimbergen: And I think the third and final piece of it is just kind of rewards and recognition. So, you kind of say this is important. You encourage people to actually invest in that time, and then the third thing is, once they've practiced that behavior, you wanna reward it and encourage it to happen over and over again. So, I think where there're examples where people have kind of gone off, and they've taken a leave to learn a new skill, maybe there's a way that you can put it into a practical application in the company, and you give them a small side project. That's not a major investment, but it's 10% of their time where they can kind of build and refine those skills. Put them into practice. It might have a business impact, it might not. But then, it at least is an example where, "Hey, the company is recognizing and rewarding this," and then they're giving folks new opportunities because they've taken the initiative to go off and learn new skills. Dave Knox: Those are some great tips. Thank you so much for taking the time. I'm excited to see where you take Springboard, as you lead them on this next part of the journey. So, thank you for sharing the time, and looking forward to talking again real soon. David VanHimbergen: Yeah, thanks, Dave. Appreciate the opportunity.